Creating a green, sustainable planet is a mission for all mankind. Kaneka knows that producing environmentally friendly products will contribute to increased profitability. There are many reasons to consider Kaneka thin-film solar panels. 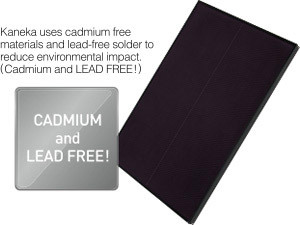 For example, Kaneka uses lead-free solder for our products to reduce the environmental impact of lead on our planet. Also, our products do not contain cadmium. This is a very important consideration when evaluating the environmental benefits of a solar module. The thickness of the Kaneka thin-film silicon solar cell (semiconductor layer) is about 3μ , which is about 1/70 of traditional crystalline silicon solar cells. That means the Kaneka thin-film silicon solar cell uses less material and energy in mass production.